The Gohyakurakan is located in the rock cave behind the main hall of Daiko-ji temple at Funaoka, Shibata-machi. These statues were carved by Doichi Kanchu a monk who was a disciple for the 13th Buddhist priest Ryuho Rokyo Daiosho, who shut himself in the mountain and chanted the sutra while carving these statues when the plague ravaged Funaoka. 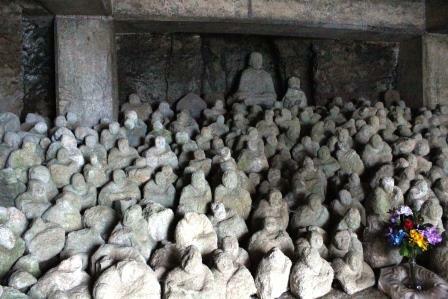 He dug a cave at the back of the main hall, with the Buddha image in the center with the Gohyakurakan to the right and left and it is said that the sect congregation were healed when he conducted a memorial service and prayer. With this achievement, Doichi Kanchu became the 14th priest for Daiko-ji temple. Due to the impact of the earthquake that occurred in Chile in 1960 and the heavy rains, part of the cave was falling down; now the cave is reinforced with concrete. It is said that Kanchu Doichi was a nephew of Matsuo Bashō, and in the garden of Daiko-ji temple is a stone monument carved with a famous phrase of Bashō. In addition, there is an old ginkgo tree that is more than 200 years old, and is registered as the town designated natural monument. This tree burned down once in the 6th year of Bunsei period (1823) when Daiko-ji temple was burned, but a new bud came out from the location where the old tree was, and has grown to the tree it is today. Daiko-ji temple is a temple that has stood in Shitaba-machi for more than 500 years and is the family temple for the Shibata house. It is referred to as the Myoko mountain in the Soto sect. It was founded by Kokai Chusan, the 4th priest for Koun-ji temple from Niigata prefecture and though the temple was suspended during the Sengoku period, in the 16th year of Tenbun period (1547) the 10th priest of Zuiun-ji temple in Marumori-cho, named Unshu Zenri revived the temple again. In the autumn of the 6th year of Bunsei period (1823), there was a fire and the temple and the temple's treasures and records were all burned. If you go up the stairs behind the main hall, you will find the tombs of generations of the Shibata family, like the tomb of Geki Shibata, the warrior who was put to the sword for the Date Disturbance.